The VideoNow! 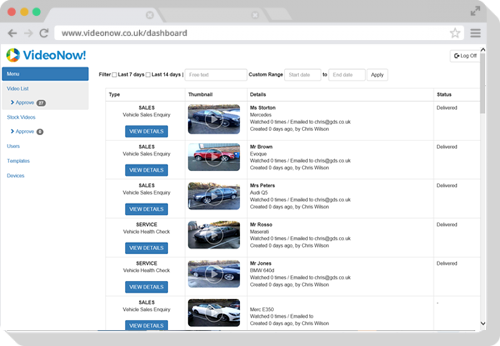 platform includes an online dashboard that allows you to manage all aspects of your VideoNow! service. The Dashboard contains a video library with search facilities which lists all videos recorded and sent through the system. You can view the Activity log for each video in turn to check for example if a video has been viewed, how many view it’s had, or of it has bounced due to an incorrect email address being entered. The Dashboard also allows you to manage the users and devices that you wish to permit to send videos on behalf of your organisation. Our service includes several email and video presentation page templates which the end user will watch the video on. You can customise the text and logos to bring in line with your existing branding if required. We can also look to make bespoke video presentation pages on request.